This is not a standard Nintendo proto -- it's a custom cart conversion done by me. I don't know if you qualify it as rarity or not but it's so cool I thought I'd send it along. What do you do if you want to play a Seiken Densetsu 3, a Japanese game, in English on your SNES. There is a high quality English translation for the game available. You could play it on a backup unit but I was looking for an in cart solution. I wanted an SD3 cart I could plug into the SNES and play. 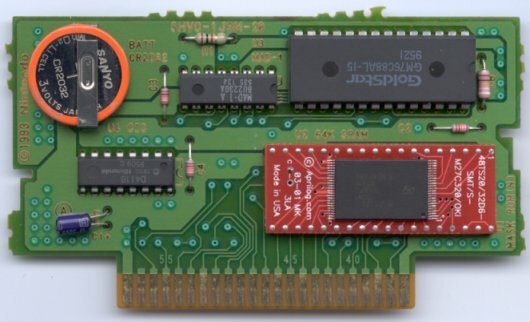 I wanted the cart to use the standard SNES cart form factor; I didn't want a Frankenstein cart that was twice the size of a real cart or something that wouldn't quite fit in a standard cart shell. You can replace the ROM in a SNES cart but since Nintendo uses a slightly non-standard ROM pinout you'll have to do some re-wiring to get it to work. This re-wiring is minimal for small ROMs but for a 32Mbit ROM you've got a major problem which likely will prevent installation in a standard cart shell. I solved it by using an adapter to convert a 32Mbit TSOP EPROM to a Nintendo DIP pinout. The quality of this thing is phenomenal. I can hardly believe how well it turned out -- and I made it. This method should work quite well for other games as well. I keep thinking that one day I'll do a Tales of Phantasia English cart.